There is absolutely no gap saying a set of professional knives of cooks is as important as a set of surgical knives. To guarantee all (or most of) ingredients remained their freshness and to make sure the finished products conveying whole flavors and shapes of ingredients, cooks – besides their personal skills – must need their right arms: professional knives. If they have enough tools with good quality, and perfect-handed - the most important element, talented cooks shall be as tigers with a pair of wings. First and foremost is the chef’s knife. 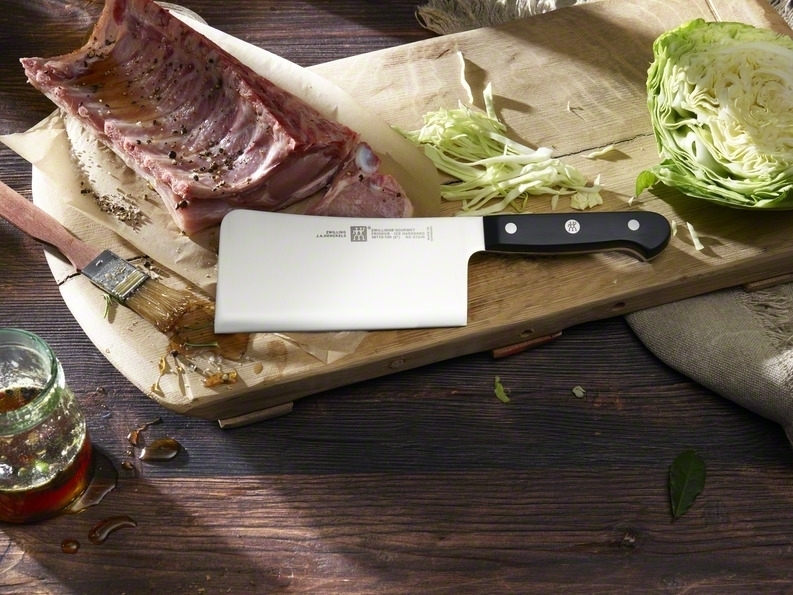 You can use this versatile blade for everything from chopping vegetables to slicing meat. 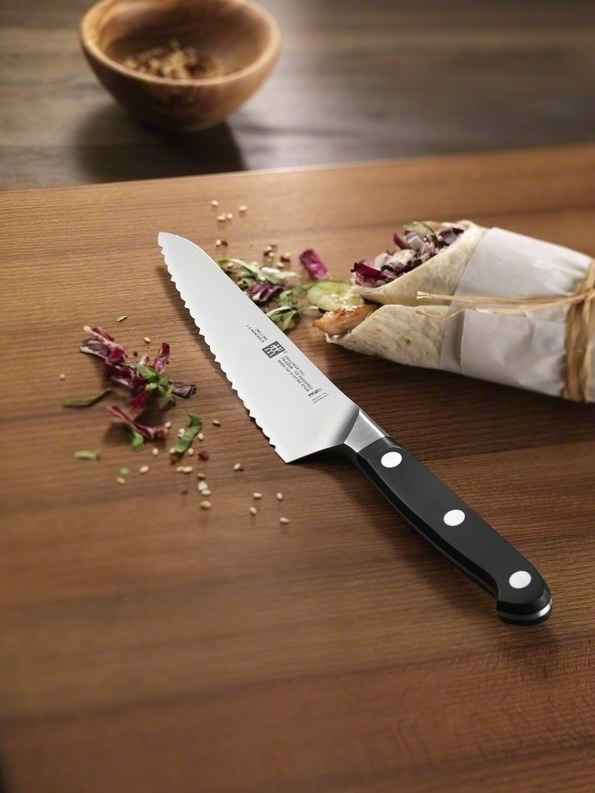 The blades of chef’s knives range from six to 12 inches, but eight inches is the most common length with 2 inches width. Even if you have small hands, a relatively long blade may be advisable, as it will offer the advantage of increased leverage. 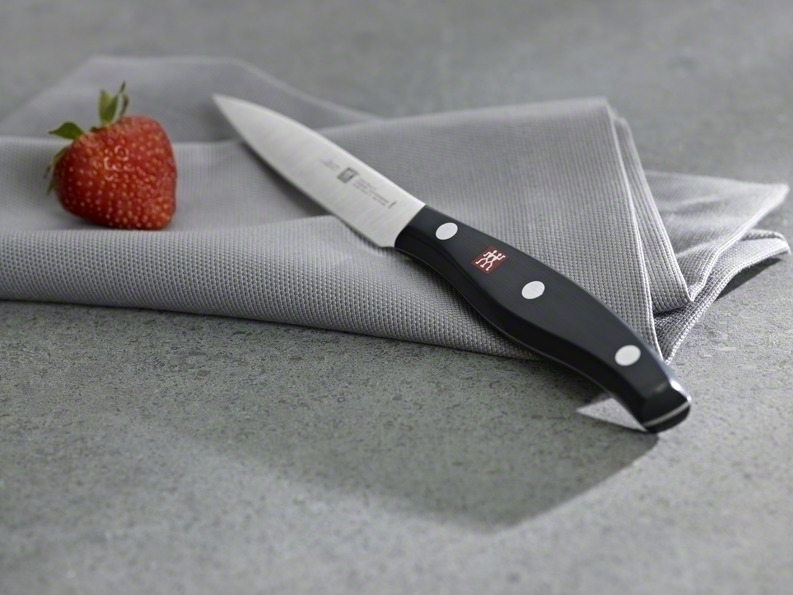 There are 2 common types of chef’s knife: French style and German style. Although the difference is quite slight at the tip, French style seems more popular and therefore more choices of prices and brands. 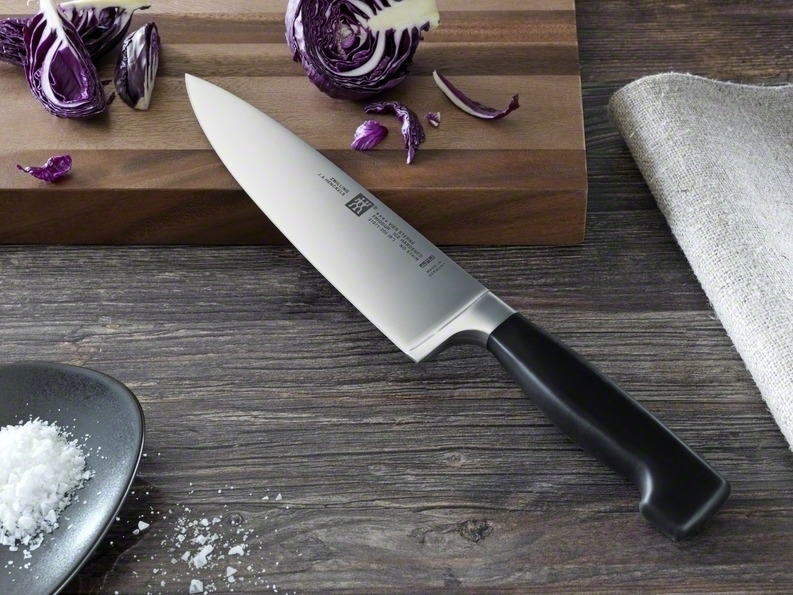 Because of its frequency of use, chef’s knife has to have a proper weight at any sizes, which means it must be heavy enough to support the hand but it also need to be light enough so the hand won’t get tired holding it. The longer the blade is, the faster it can slice if it’s the right knife. Therefore, the key element here is neither expensive nor qualified but a suitable-handed knife for the cook. A little knife often harbors a great blade. 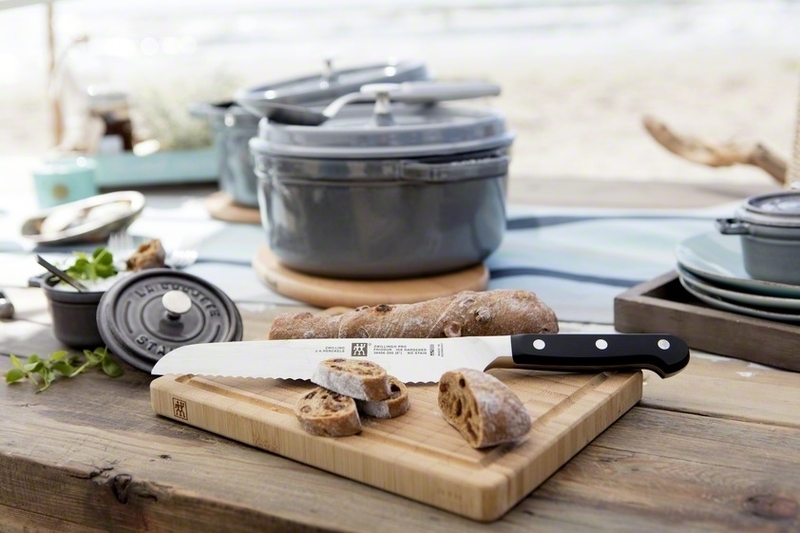 We can tell that paring knife is the little version of chef’s knife in usage. A paring knife is excellently flexible because of its little size, peak tip, and sharp blade but of course its main uses is to pare vegetables and get meticulous jobs done, such as cleaning shrimps’ intestine, taking chili’s seeds, or paring scallion. With a blade length of about 3.5 inches, it is ideally suited for detail work. While it’s perfect for slicing or mincing many fruits and vegetables, avoid turning the paring knife on harder vegetables. Carrots, for instance, require a heavier blade. Keep in mind that you should not have to apply much force to the blade. If you do, it may slip and cause injury. If you were a chef of western cuisine, or if you just love western cuisine, definitely you have had this type of knife in the kitchen since bread is a very unpleasant food to deal with. French bread itself has crunchy hard crust yet soft and crumb. When it get cooling off, the crumb become thickened and chewy that a regular chef knife can’t never handle to make a slice; the whole loaf would be squeezed and the slicing surface would be totally damaged. And that’s where a bread knife jumps in with its saw-like edge and delicately makes a perfect piece of dinner rolls, divines a baguette, or beautifully slices a sandwich loaf. Bread knife’s blade is usually very long, around 30cm, to make sure it goes through the whole bread loaf. Finally, bread knife works well with cake and gateaux, too. Its name clearly shows its roles: utility and easy to use in most cutting jobs, from slicing, paring to chopping. Utility knife has an average long blade around 6 inches and an oval handle. 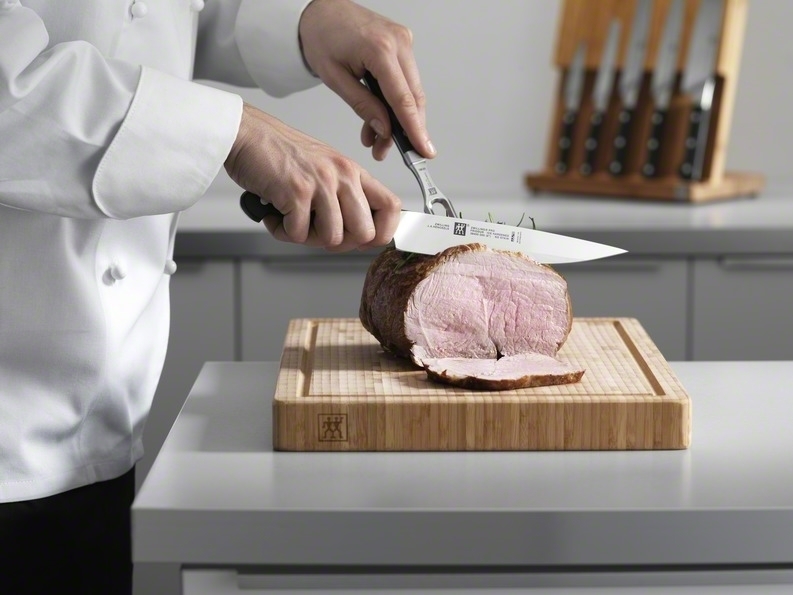 The blade must be made from quality steel since it is frequently used as much as chef’s knives in kitchen. Manufacturers even want to use up its utility by making its blade serrated to handle picky food as bread, hard sausages, firm cheeses, and other structure-complex food like ripe tomatoes. As a bred knife, serrated bread can easily slice hard chewy crust without damaging tender parts inside. 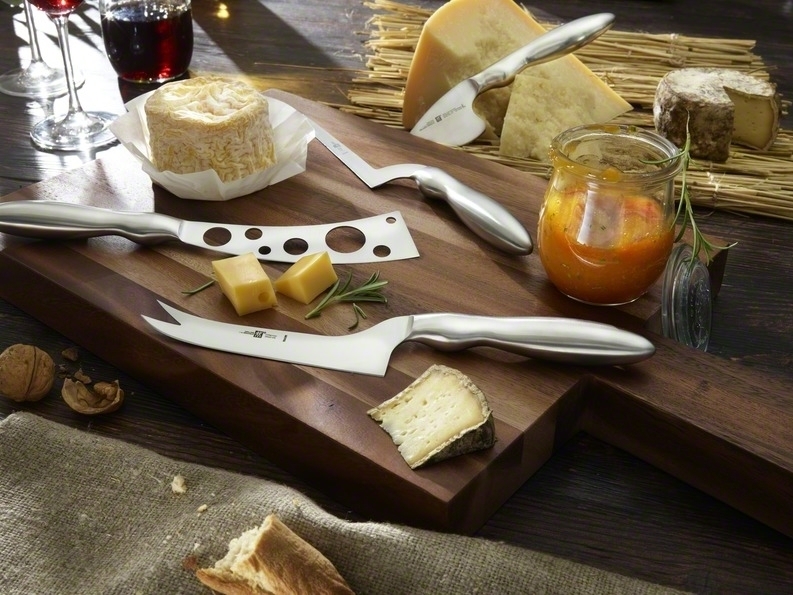 Having similar length with utility knives but boning knife carries a special blade: curvy, thin, and peak at tip. This type needs a flexibly slim blade so it can bend and wriggle into tiny corner to separate bones from flesh. The flexibility of boning knife’s blades is different depending on ingredients they’re dealing with. Red meat need a flexible yet hard blade to bone out and to slice flesh while white meat and fish just need a softly flexible blade. 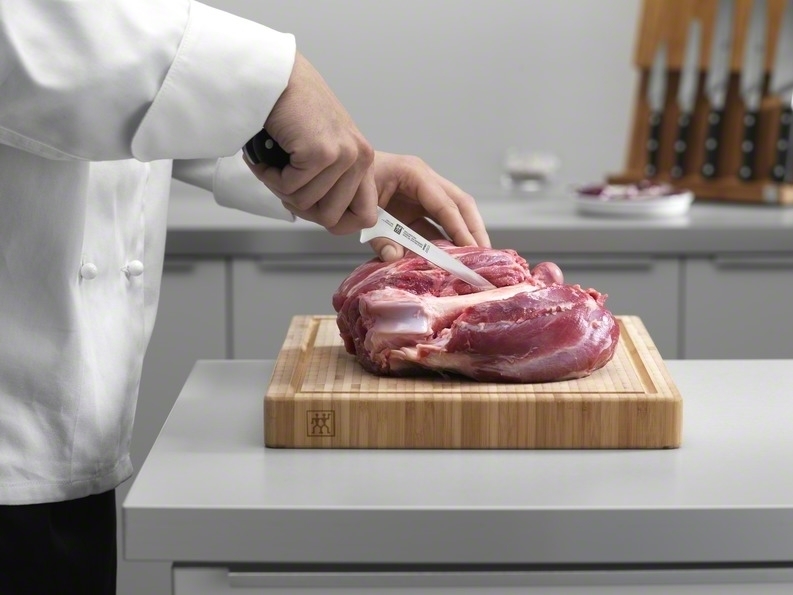 In some cases, boning knives can replace fillet knives. This is a should-have knife in any kitchen. In stead of buying separate bones and meat from butcher’s stores, skillful cooks can buy a whole fresh part of meat and bone it out at home with more reasonable price and sanitary. Westerners are most familiar with cleavers as crude tools of butchery but there is tremendous variety and versatility in this class of cutlery. Traditionally, Chinese cooks use a single cleaver shaped knife for every task in the kitchen. The Chinese cleaver or Chinese chef’s knife is a thin delicate knife that slices and chops well with height that can be used to scoop up large volumes of product and enough mass that the spine or flat of the blade can be used to crush product before cutting. On the other end of the spectrum, larger, beefier cleavers are some of the few cutlery tools designed to handle cleaving bone in proteins without damaging the knife. With such a range of applications, cleavers are fun, novel, and versatile options to fill pretty much any role there is for kitchen cutlery. In fact, the world of kitchen tools is much larger with thousands of professional and specialized items, some things that common people can’t identify what they are, such as choppers, tomato slicers, or cheese graters. Despite of the fact that professional knives are so diverse, there is only one rule to choose your knives, which is perfect-handed. Otherwise, quality, brands, or prices of those “cooks’ right arms” do not mean anything if they’re too heavy or too light.